Buzzwords abound in today’s manufacturing and logistics industry. As technologies develop, emerge, and take hold, so does a new vocabulary companies must embrace in order to successfully leverage the concepts, principles, and philosophies of an ever-evolving business landscape. One such buzzword or topic of the day many planners and managers come in contact with yet fail to fully realize is postmodern ERP. Whether it’s because the lack of visibility surrounding these concepts or a failure to fully embrace them as part of lean manufacturing and supply chain management, postmodern ERP is perhaps one of the most least understood or actualized elements of manufacturing and supply logistics. Not only does postmodern ERP have the potential to transform a company’s manufacturing and supply logistics, but it’s a key element in cutting the complexity of global supply chain management and leveraging enhanced operational functionality. As something of a branch from enterprise resource planning (ERP), postmodern ERP takes the next step in helping companies across a number of critical functions in planning and production. But in furthering our understand of these buzzwords or key terms (like postmodern ERP), today’s manufacturing and logistics companies must ask themselves: What is so modern about postmodern ERP? What does postmodern ERP actually mean in terms of the day-to-day operations? What is the true value proposition of postmodern ERP in a global production and logistics network? Does Postmodern ERP Actually Provide Value? Today’s manufacturing and supply chain planners and managers are inundated with concepts and strategies purporting to add value to their overall value chain. Whether it’s integrating intelligent planning systems or working to streamline their manufacturing processes from procurement to production, manufacturing companies must seek value in any number of ways in order to remain competitive and agile in an increasingly global marketplace. One place where manufacturing companies have been comparatively slow in realizing and leveraging value is enterprise resource planning (ERP), or more specifically, adopting a postmodern ERP mindset. Whether it’s because the lack of visibility surrounding these concepts or a failure to fully embrace them as part of lean manufacturing and supply chain management, postmodern ERP is perhaps one of the most least understood or realized element of manufacturing and supply logistics. Not only does postmodern ERP have the potential to transform a company’s manufacturing and supply logistics, but it’s a key element in cutting the complexity of global supply chain management and leveraging enhanced operational functionality. 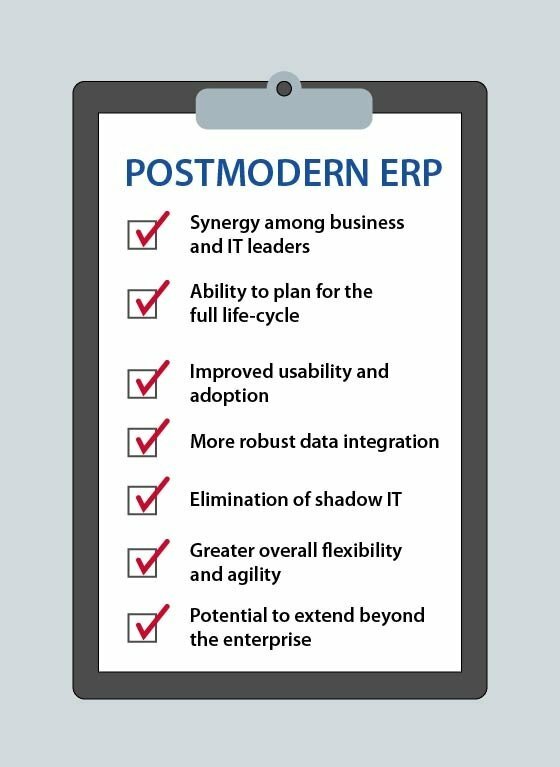 Postmodern ERP: Not Just a Return to "Best of Breed"
How does your organization approach enterprise resource planning (ERP)? Not so long ago, ERP was completely absent from supply chain management strategy. Today in many organizations ERP dominates software solutions. But innovative supply chain leaders are adopting a new approach to ERP, one that goes far beyond "best of breed." This postmodern ERP fosters strategic collaboration between business and IT leaders and sets organizations on the path to thriving in the Industry 4.0 environment. On a recent cross-country flight, I was seated next to a supply chain manager for Company X who, after furiously typing away on his laptop for an hour or so, expressed concern about his company's current ERP (enterprise resource planning) solution and strategy and whether it was well-suited to meet the demands of today’s global supply chain. This planner told me his biggest fears about his company's ERP model was its ability to remain lean, agile, and cost-effective in conceiving and implementing planning solutions and strategies. This planner is not alone in his anxiety. A recent Gartner survey indicated ERP efficiency ranked fourth overall among the top concerns of manufacturers and suppliers.